Press brake bending is the theory for all press brake tools manufacturers. When the customer asks for tonnage, springback, tolerance, angle - all what is possible to provide is the main theory. Yes, it is based on some experience, formulas, ideas and calculations but when the tool was not tested with your steel - there are only theoretical parameters. Moreover everybody who works in production is informed that even the same trademark of material from different batches could lead to different results in deformation. How theory becomes practice. There is no magic - nobody of press brake tools manufacturers has in workshop press brake even for 100 tons to test all parts. So normally any test goes to the small length of part to test with compact press brake. 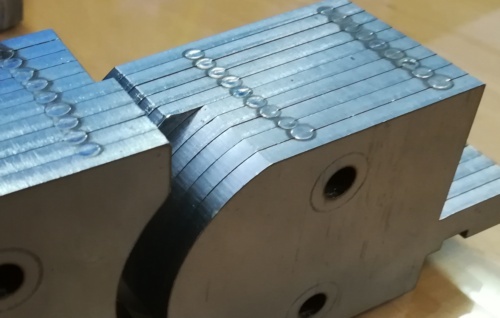 Moreover if customer asks strict tolerances probably everybody ask for bigger gap - it is hard to take all costs for mistakes and to guarantee something extremely precise and special. And there is other black spot - even if you can test tool for 100 mm it doesn't guarantee that results will be the same in two meters - there are longitudinal relations as well. But anyway if the tooling should be shipped and the shape is special, it is impossible to ship the theoretical shape and non-tested production result because the manufacturer should have some obligations about the tool he developed. That is why the question in-shop testing is necessary and should be solved before shipment. How to test if possible to test? There are two main available small costs practices: laser cutting sections with welding or plastic based dimensional printing. Plastic based printing is completely new solution with incredible advantage - just necessary to have 3d printer to make the prototype. But there is also one big disadvantage - plastic is not the metal and this means strength of plastic is enough to test special tools for thin material applications. But anyway plastic prototypes have the good future for development - 3d metal printing is the nearly future. Moreover to add more strength to the tool it is made not only with plastic 3d printing but with some internal metal inserts around the working zone to prevent some big deformation. Anyway it is not the working solution but the tool for tests. Laser cutting together with the welding - traditional testing process to make small section of special tool. Disadvantage of the process is the access to laser cutting machine but the advantage that you will have real metal not hardened tool with the necessary shape to make the test bend. Is there the future for development? Hard to say but replacing of laser cutting to waterjet can give the possibility to cut solid sections about 50 mm or more with greatest precision. It is also important that the costs for preparation of such shape are very low to make just several cuts in one sheet. What is the final for the test? Normally the bend quality and geometry which is acceptable by the customer to start the manufacture of normal bending tool with proper material and hardening. Or the feedback that allows to make modification. The reason of testing and testing tool prototypes is very important - nobody wants to deal with the modification of prepared and hardened tooling after the sale. And any possibilities should be used to reduce to the minimum of any risks. So the test prototype is the way to control the deformation to remake the theory into the real bend. Anyway every repeatable process has the solution to realize but based on the limits for part and the tool. It is the question of experience and the field knowledge. The main point is usually only one - customer has the real and reasonable requirements and accept the calculations of special tools. All other should be the subject of study. And there is no the black point, even with thick material is possible to make the modulation of forces and stress to have the theory realistic. It is not usual procedure but helps to terminate the black spots.